Students often find it difficult to grasp fundamental ecological and evolutionary concepts because of their inherently mathematical nature. Likewise, the application of ecological and evolutionary theory often requires a high degree of mathematical competence. This book is a first step to addressing these difficulties, providing a broad introduction to the key methods and underlying concepts of mathematical models in ecology and evolution. The book is intended to serve the needs of undergraduate and postgraduate ecology and evolution students who need to access the mathematical and statistical modelling literature essential to their subjects. 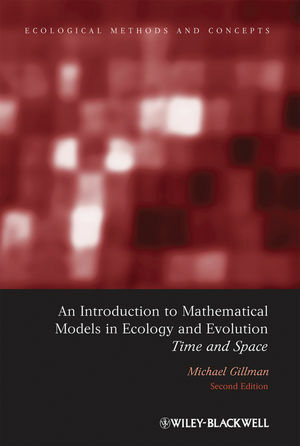 The book assumes minimal mathematics and statistics knowledge whilst covering a wide variety of methods, many of which are at the fore-front of ecological and evolutionary research. The book also highlights the applications of modelling to practical problems such as sustainable harvesting and biological control. Based at the Open University since 1990, Mike Gillman has contributed to a diverse set of undergraduate and postgraduate courses in biological and environmental science. His research interests are equally broad, spanning population dynamics, community ecology and evolutionary biology. He has a particular interest in the environment and conservation of Neotropical forests. Written clearly and succinctly, requiring minimal in-depth knowledge of mathematics. Introduces students to the use of computer models in both fields of ecology and evolutionary biology.